ISC's provides your organization with friendly support when you need it. Our technicians are trained and certified in computer hardware and software. We work with companies and home users. Companies can take advantage of our professional helpdesk by outsourcing all end-user support issues to our highly trained staff. Please contact Eric Vanderburg or Chris Bach for details. Our helpdesk is an excellent way to help you with many of the common problems or questions you may have and, best of all, you don't have to schedule an on-site service call. You get immediate service and quality results. We use secure software from Microsoft (Microsoft Remote Assistance) to access your computer remotely and actually view your desktop and manipulate the mouse and keyboard to address your issue. You'll have complete control the entire time and none of your data will be transmitted over the link. We know how precious your time is and we want to resolve the issue as quickly as possible. You can help us by having this information handy before calling. Know your computer's brand, model and operating system. If you are having difficulties with an application, find your software version. With the application you want information about open, click the name of the application in the upper-left corner of your screen (next to the apple icon). Click About and then select the application name. This will open a window with information that includes the version number of the application. With the application you want information about open, click Help in the menu at the top of the window. Click About and then select the application name. This will open a window with information that includes the version number of the application. Have you made any new changes to your computer? Have you had previous communications with computing consulting? What were the results? 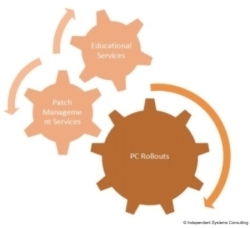 PC rollouts - We can deploy new systems at your organization with required software and IP configurations. We will provide you with system images so that it will be easy to restore machines to their original state.